Laser Tag Roll Tickets are brightly colored tickets roll tickets. Each 2" by 2" ticket is individually numbered within the roll. 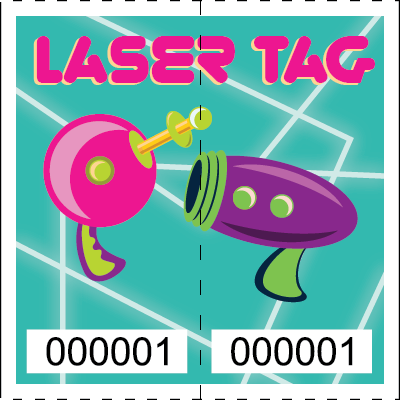 Great for admission tickets to laser tag events, great for birthday parties, company team building events, etc... Although these are stock tickets - these are really a great starting point for customized roll tickets - call us about creating a custom admission ticket for your Laser Tag facility. Laser Tag businesses often also need custom wristbands as well as food and drink roll tickets - we are your one stop shop. Call 800-368-8311 to talk about customization options.